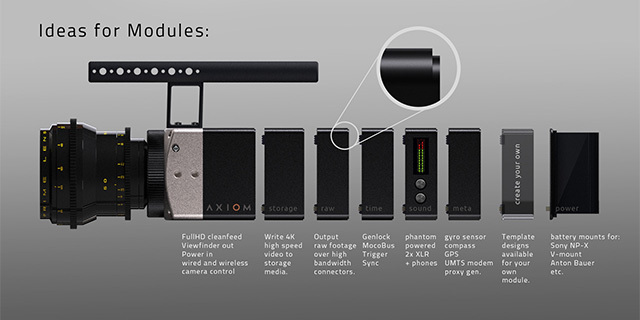 The folks over at RedShark wrote a nice article about the upcoming new open source camera Axiom by Apertus and its open module concept. In short terms you will be able to scale your camera up or down in functions and features. Just the way you need it for your production. Thanks to open source, you will also be able to write your own software or modify the existing. The frustration of locked-down proprietary camera firmware is one that many of us are familiar with. It’s pretty annoying to have a camera that could clearly be capable of all kinds of things but is heavily restricted by the locked-down software it is running. This is of course the origin of the Magic Lantern project, which was borne of the frustration of camera hardware that was capable of doing so much but was restricted by the built in firmware and the policies of the companies involved. It has taken a lot of work by the Magic Lantern team to gain access to the camera and to build an understanding of the way it functions, so that they could run their own software alongside the camera firmware and new features could be added.